(Hong Kong, 02 February 2018) Vitargent (International) Biotechnology Limited (“Vitargent”) published new test results following the previous investigation in cooking oil, BB cream, instant coffee, sunscreen, ice cream, lip balm, liquid milk products and lipstick. 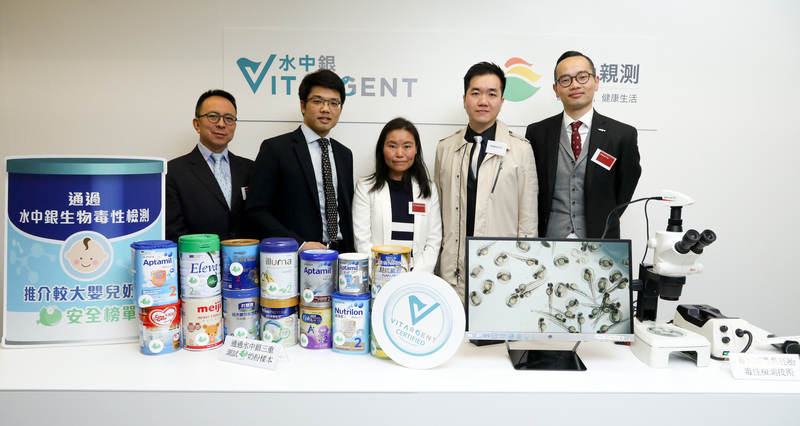 Vitargent performs toxicity tests on 16 milk powder samples from 11 renowned brands in the market with the application of unique in the world “transgenic medaka” and “zebrafish” embryo toxicity testing technology developed by Hong Kong scientist. Follow-on formula milk powder (Formula 2) for 6 to 12 month-olds is the main focus of the toxicity test. All powder milk samples passed the safety requirements according to the test results. Among the samples, 14 are rated “Green Fish” (excellence) in terms of safety and 2 are rated “Yellow Fish” (basic). The differences in safety ratings are determined by the acute toxicity test of zebrafish embryos. With reference to international toxicology data and reports, it is suspected that the toxic reaction might have resulted by individual or combined effects of major ingredients including milk or fat derived from various vegetable oils. Green Fish mark is recommended for consumers as a sign of quality product. The majority of standard infant formula milk powder in the market are artificially produced with nutritional ingredients found in breast milk in addition to milk extract. The current trend of infant formula milk powder in the Hong Kong market targets at different age group, with follow-on formula milk powder as the main focus in sales and advertisement. Since imported powder milk are required to meet the International Organization for Standardization (ISO), there are no distinct variation in the nutritional ingredients between different brands. Vitargent collected samples from 11 renowned powder milk brands including Mead Johnson, Friso, Abbott, Cow & Gate, Wyeth etc, from the Mannings Store, Watsons Store, Eugene Baby and local pharmacies in Hong Kong from December 2017 to January 2018. A total of 16 follow-on formula milk powder were being sampled (Formula 2, for 6 to 12 month-olds). Three of which are stated as suitable for 0 to 12 month-olds (2 samples) and 6 to 18 month-olds (1 sample). Red Fish means “Sub-Optimal” in terms of safety, indicating a product is below standard in one or more criteria in the screening of acute toxicity, chronic toxicity and ingredient check. Consumers are recommended to purchase with extra caution. According to the food labelling regulations in Europe16, USA17 and Hong Kong18, each ingredient must be listed proportionately according to the weight and size, from the highest proportion to the lowest. Milk extract (skimmed milk and powdered milk) are listed on the top of the label. According to the liquid milk and milk products test results from last year, toxicity level of milk varies. Multiple international toxicology reports on milk reveals that there are other toxicity risks in milk products. Toxicants found in milk include the well-known microcin (aflatoxin)19, residues of veterinary drug20,21, pesticides residues22,23 and other unknown contaminants including melamine24, we have every reason to believe that contaminated milk is the cause of the additional toxicity. Another main ingredient of milk powder is fat, usually consist of various vegetable oils (including soybean oil, sunflower oil, coconut oil, rapeseed oil, and palm oil) combined. “According to Vitargent’s edible oil data, the test result of coconut oil, sunflower oil, rapeseed oil and palm oil were below average. It indicates that vegetable oils might increase the risk of toxicity. We therefore recommend Green Fish milk powder for safe consumption.” Jimmy Tao added. 2 CODEX STAN 156 – 1987 (Revision: 2017). Codex Alimentarius. Standard for follow-on formula. 3 CODEX STAN 72 – 1981 (Revision: 2007). Codex Alimentarius. Standard for infant formula and formulas for special medical purposes intended for infants. 4 Regulation (EC) No 1333/2008 of the European Parliament and of the Council of 16 December 2008 on food additives. Official Journal of the European Union. L 354/16. 31.12.2008. 5 Commission Regulation (EU) No 1130/2011 of 11 November 2011. amending Annex III to Regulation (EC) No 1333/2008 of the European Parliament and of the Council on food additives by establishing a Union list of food additives approved for use in food additives, food enzymes, food flavourings and nutrients. Official Journal of the European Union. L 295/178. 12.11.2011. 6 Commission Regulation (EU) No 1129/2011 of 11 November 2011, amending Annex II to Regulation (EC) No 1333/2008 of the European Parliament and of the Council by establishing a Union list of food additives. Official Journal of the European Union. L 295/1. 12.11.2011. 7 Regulation (EU) No 609/2013 of the European Parliament and of the Council of 12 June 2013 on food intended for infants and young children, food for special medical purposes, and total diet replacement for weight control. 8 Commission delegated regulation (EU) 2016/127 of 25 September 2015. 9 USFDA Food additive status list, Color Additives in Food, and Everything added to food in the United States (EAFUS). 14 Standards for use, according to use categories. Effective from September 26, 2016. 15 European Chemicals Agency (ECHA). Candidate list of substances of very high concern for authorization. 16 CFR 101.4(a). Code of Federal Regulations: Food; designation of ingredients. 17 Food and Drugs (Composition and Labelling) Regulations (Cap.132W). 18 Regulation (EU) No 1169/2011 of the European Parliament and of the of 25 October 2011. Official J Eur Union. L 304/18. 22.11.2011. 19 Jawaid S et al. Contamination profile of aflatoxin M1 residues in milk supply chain of Sindh, Parkistan. Toxicology Report. 2015, 2: 141801422. 20 Rama A et al. Assessment of antibacterial drug residues in milk for consumption in Kosovo. Journal of Food and Drug Analysis. 2017. 25: 525-532. 21 Han RW et al. Survey of veterinary drug residues in raw milk in Hebei Province, China. Journal of Food Protection. 2017. 1890-1896.